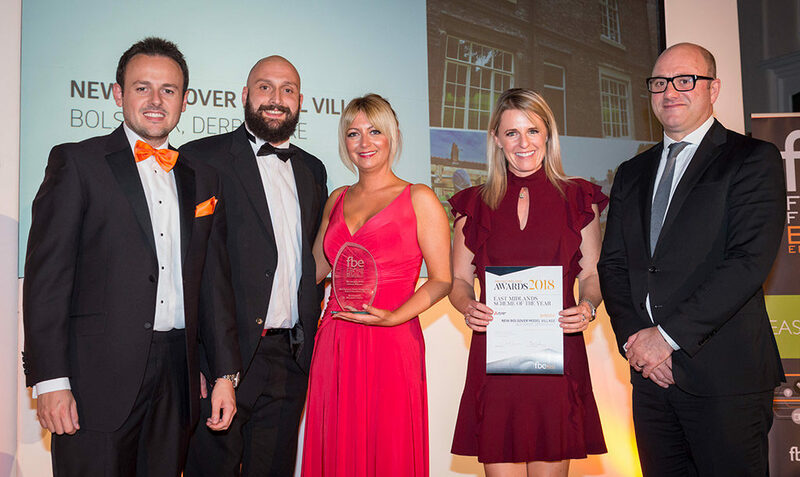 A project to breathe new life into almost 200 19th Century Grade II listed properties and encourage community engagement in the area has been crowned the winner at the fbe East Midlands Awards 2018. 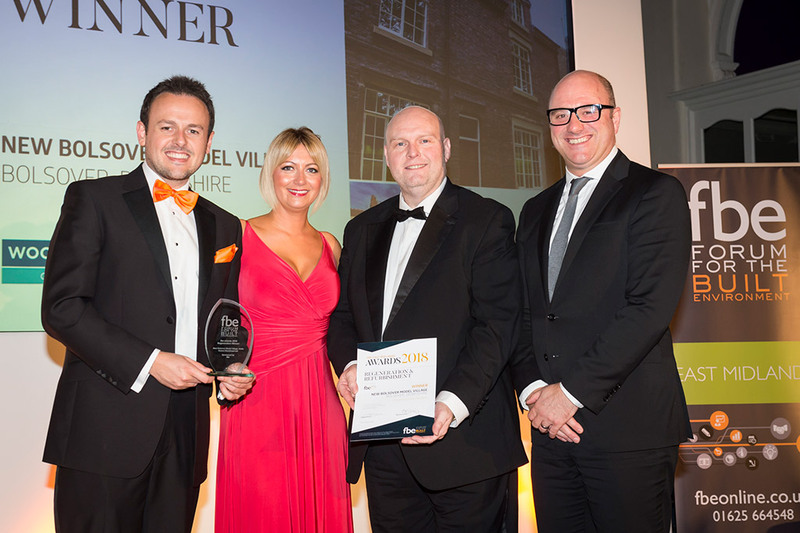 New Bolsover Model Village in Derbyshire was named East Midlands Scheme of the Year at the awards ceremony, sponsored by Mitsubishi Electric and staged at the Albert Hall in Nottingham. The project – nominated by contractor Robert Woodhead Ltd – had earlier taken the top slot in the Regeneration Award category, with the judges saying: “This project quite frankly blew the judges away. This visionary regeneration project for one of the most socially deprived areas of the UK is an exemplar project. Other members of the team who undertook the work for Bolsover District Council included architects Halsall Lloyd Partnership and structural engineer BSP Consulting. The winner of the Non-Residential Award, sponsored by The Survey Hub, was the High G Training and Test Facility at RAF College Cranwell, Sleaford, in Lincolnshire, nominated by Galliford Try Building East Midlands. Other members of the team who completed the project for the Royal Air Force for client Thales UK Ltd included architect Fairhursts Design Group, structural engineer White Young Green, M&E consultants Bianco Sale Ltd, M&E contractor Integral, AMST (centrifuge designer and manufacturer), GE Sharpe & Co (Employer’s Agent) and Reed Holland Associates (client advisor). The winner of the Residential Award, sponsored by Faithful + Gould, was Knights Close, Billesdon, Leicestershire – an affordable housing scheme built for Seven Locks Housing by Geda Construction. Designed by Pelham Architects, with BSP Consulting the structural engineer, the scheme involved the demolition of vacant and unsightly bed-sit flats previously occupied by elderly people and the construction of 18 mixed-dwelling units to revive the area and enable local residents to remain in their community. The winner of the Rising Star Award, sponsored by Duncan & Toplis, was Dannielle Baguley, apprentice resident liaison officer in the regeneration team at J Tomlinson Ltd, who delivers support to residents of Ashfield District Council while they have improvement work undertaken on their properties. At the same time, she is studying for an NVQ in customer service. Commendations were awarded to the two other finalists in this category – Shivam (Shiv) Radia from Edward Cooper Young and Mohammed Moosa from YMD Boon. Around 140 guests attended the fbe East Midlands Awards, which celebrated some of the best schemes from Derbyshire, Leicestershire, Lincolnshire and Nottinghamshire, along with the brightest young professionals in the sector. During the evening, they raised £1,400 for Maggie’s Nottingham, which offers professional support for those with cancer and their loved ones. This was generously match funded by The Woodhead Group, whose scheme took the East Midlands Scheme of the Year and the Regeneration Award, taking the total to £2,800. Guest speaker at the event was Maria Coulter, aka The Construction Coach, who is an award-winning coach working with SMEs and micro-businesses. Chair of the fbe East Midlands, Emma Atkins, said: “This year we had a really strong selection of nominations across all categories which highlighted the diversity and quality of projects being undertaken in the region, as well as the talents of the young professionals in construction, design and associated professional and support services for the industry. The Forum for the Built Environment (fbe) is one of the leading independent built environment networking organisations. It has more than 1,000 members nationwide from a wide variety of backgrounds – multinational construction companies, cost consultants, architects and designers, property developers, engineers, planners and consultants, legal & financial specialists and other service professionals.